BOSTON — Massachusetts’ new budget includes $1.5 million for a new “rural school aid” account championed by Sen. Adam Hinds, D-Pittsfield. Nearly one month into the state’s new fiscal year, Republican Gov. 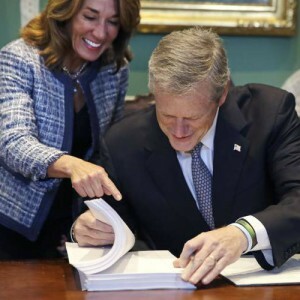 Charlie Baker signed the $42 billion spending package into law Thursday, ending the state’s status as the only one in the nation without a permanent budget. The rural school aid provides additional funding for an estimated 62 school districts – mostly in Western Massachusetts – that have enrollment of fewer than 21 students per square mile and per capita income below the state average, with priority given to districts serving fewer than 11 students per square mile. The budget also includes $4 million for the Healthy Incentives Program, allowing it “to build on the success of its first year, which provided nearly 40,000 families with fresh, healthy, local food, and millions of dollars in sales to Massachusetts farmers,” said Winton Pitcoff, director of the Massachusetts Food System Collaborative, which advocated for the program. Baker vetoed nearly $50 million in spending from the plan. Among the vetoes were $100,000 for rehabilitation of the Leverett Crafts and Arts building, $100,000 for Friends of Leverett Pond to repair, design, permit and construct a dam at Leverett Pond, and $50,000 for the Athol-based North Quabbin Community Coalition’s school-based health program. Baker also rejected a pilot plan to discount tolls for motorists who commute during off-peak hours.